I’m really excited about this design and so I hope you like it as much as I do! I had a bit of a delay in getting it to you, having run out of yarn for the fringing with only 2” to go… It’s worth the wait though, as this shawl is so lovely and warm, and I hope you agree it looks good too. 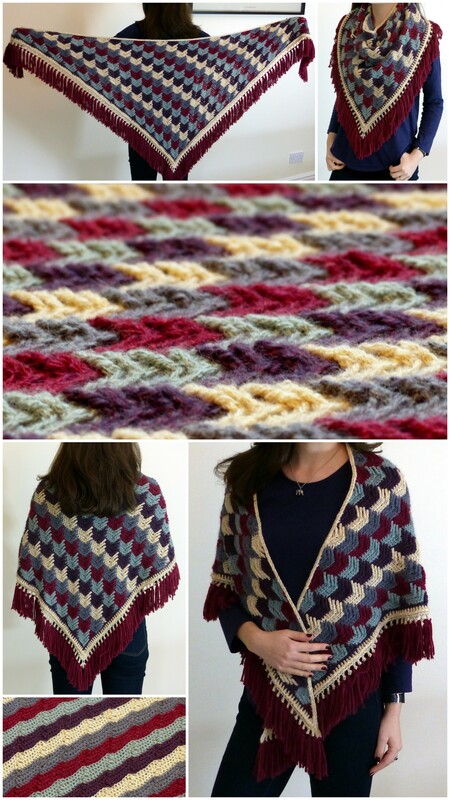 You may be familiar with diagonal raised stitch, which is sometimes modified to make the apache tears pattern (I first saw this used by Sarah London though I have since been spotting it all over Pinterest and Ravelry.) The design is built up using front post double crochet stitches repeated at intervals and shifted along one place each row. Sometimes the post stitches are worked into unused front loops on the work, if only back loops are used for the main stitches in the design. This pattern is based on a similar principle, but I have used front/back post stitches which are taller to build up the large chevron design (or arrow tails). It is worked back and forth in rows, crocheting over ends to eliminate almost all of the weaving in. The shawl is worked diagonally from the top corner across and down. (See here for more info on triangular shawl construction types.) This is quite handy as it means you can try it on as you go, stopping once you feel it is the right size to add the border. 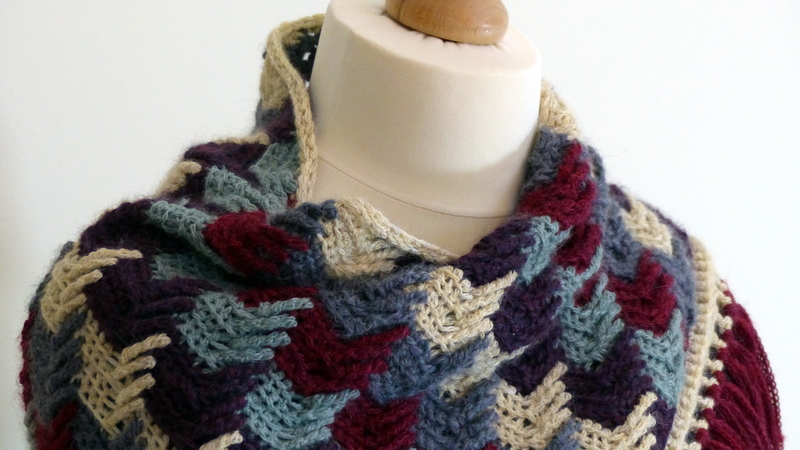 The back of the shawl comes out as plain stripes so you can even reverse the design if you like for a different look! 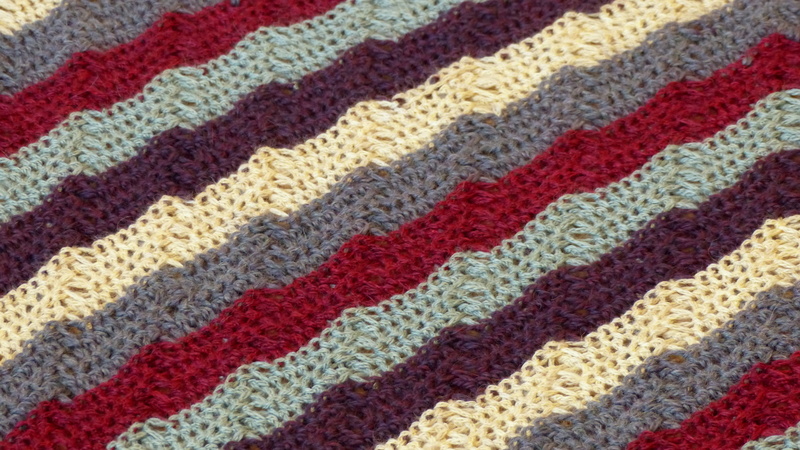 This pattern really is very simple to work once you have done a few stripes of colour. You can use any number of colours from 2 upwards. Example shown is heavy dk/light Aran weight yarn. You can substitute any yarn weight, but make sure you go up around 2 hook sizes to usual. This is because the raised stitches combined with single crochet make the fabric very dense, and this way the fabric will still turn out to have some drape. I recommend using a soft yarn also to add drape – e.g. merino or alpaca. Avoid cotton unless it is a soft blend! Example shawl measured 1.5m pre blocking and 1.65m after blocking (not including fringe). The pattern is an 8 row repeat – but you will see it is very easily memorised as it is only the first and last few stitches of every row which alter each time. Work odd rows in the back loops (b.l.) and even rows in the front loops (f.l.). The exception is the front of work dtr (f.o.w. 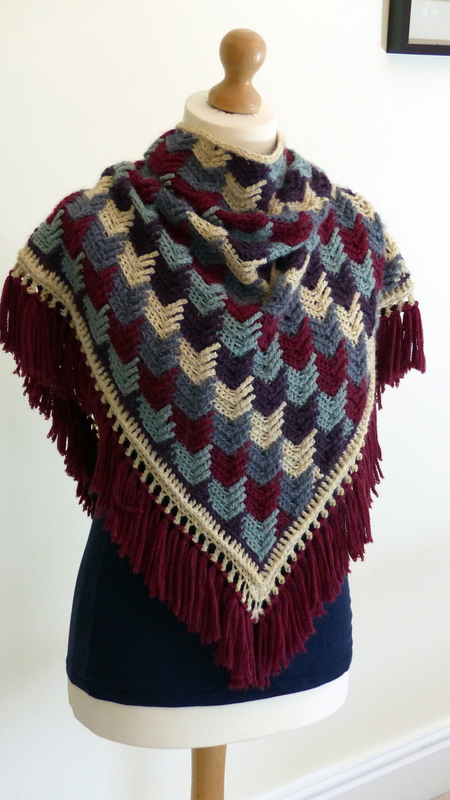 dtr), which is a dtr worked into the unworked loop of the stitch 4 rows below, always on the front (right side) of the shawl irrespective of row direction, so that the chevron pattern is made on the front and the back remains plain stripes. The f.o.w. dtr stitch acts like a post stitch – it counts as being worked into the next st (i.e. leave one st unworked behind it). You will be changing colours every 4 rows for the main part of the body. Remember ch1 at the start of the row does not count as a stitch. Please note, the diagram provided omits chains AND sc stitches which are obscured behind the f.o.w. dtr sts, for clarity. The front of work double treble –slipped stitch is worked exactly as a regular dtr stitch, except you will be joining it to the front loop of the stitch which would normally be left unworked by the f.ow.dtr stitch. It is used here when making a f.o.w. dtr at the very end of the row. The “slipped” element helps stabilise the edge. Yarn over 3 times, insert hook into front loop of stitch 4 rows below, draw up a loop, *yarn over, draw through 2 loops, repeat from * 2 more times so that 2 loops remain, insert loop into front loop of topmost stitch, yarn over and draw through, draw this loop through the remaining 2 loops on hook. Begin with red yarn. Ch2. Change to next colour (green) prior to making the turning ch. Change to next colour (purple) prior to making the turning ch. Change to next colour (cream) prior to making the turning ch. R13-R20 form the repeating rows. (There are no repeats the first time through and each row adds one stitch to the total st count). Continue to alternate working in the b.l. on odd rows and f.l. on even rows to maintain pattern. Change to next colour (grey) prior to making the turning ch. Change to next colour (red) prior to making the turning ch. Repeat rows 13-20, changing colours as desired until your work is the desired size, ending on a row 16. This ensures that you have a row of arrow tails travelling down the centre of your shawl making a nice point at the bottom corner. Now add a finishing row to maintain the pattern down the working edge and make sts for the border rows. You will be working 3 raised sts in front of the work in a row. Anchor them to the edge by using the “slipped” technique used at the ends of R16’s – draw the final loop through both the front loop and the 2 loops on the stitch. R21: sc into 1st st, hdc into f.l. of 1st st, f.o.w.tr-slipped, dc-slipped, sc (through both loops of the st), 4sc, f.o.w. dtr-slipped, f.o.w.tr-slipped, dc-slipped, sc (through both loops of the st), repeat from * until 4 sts remain, 4sc. In the same st just worked (or into the turning ch if you can), work (3sc) to turn the corner, place a st marker into the central st to mark the corner. Work 1 sc into the side of each row down the entirety of the other side, and (2sc) into the final row. The st count should be the same along both sides. Fasten off. Using the border colour, join into the first st of R21 to work in the same direction just worked. Join using a standing dc or a ch3 (counts as a dc) if you prefer. Join into the b.l.o. for entire row. R22: (2dc) into first st (so that there are 3 sts made). Dc into each st until you reach the centre st, (2dc, tr, 2dc) into central st, place st marker in centre st, dc in each st to final st, (3dc), ch2, turn. R23: (2bpdc) around last dc worked, bpdc into each st until central st, (5bpdc) about central st, place st marker into centre st, bpdc in each st till final st, (3bpdc), ch3, turn. R24: Work in b.l.o. ch1, dc in same st, *ch1, sk1st, dc, repeat from * until 1 st remains before central st. (If you have ended up without a spare st before central st, don’t worry, just reflect what you do about the centre). Ch1, sk st before centre, (dc,ch1,dc,ch1,dc) into central st. *ch1, sk1st, dc, repeat from * until you have worked a dc in the final st. Ch2, dc in same st.
Now ch1 and rotate the work to neaten the top edge with a row of sc. Work 2sc in each dc st post, and 6 sc in each stripe of 4 rows, all the way along the top edge. Ch1, turn, and work 1 bpsc about the post of each sc just worked back along the top edge to define the top line really well. To add the fringing, cut a piece of card to your desired fringe width. Mine was 12.5cm (5”). Your fringe will shrink back a little from the width of the card so if in doubt cut it a little big (you can always trim it). Wrap your yarn around the card until it is full but no wraps overlap. Cut the fringe along the card edge. I used 3 pieces of fringe per ch1 space in the border. Line up the ends and double them around, grabbing the middle with your hook, draw them through the ch-sp and pull the ends through for a lark’s head knot. You can do this either way around but use the same direction for all your knots. Of course you don’t need to add the fringe but could leave the shawl as is or add an alternate border. I recommend blocking using your preferred method. Blocking adds drape to the dense fabric. Use your preferred method for your yarn type. I wet blocked mine and combed out the fringe while damp to remove any kinks. *Gasp* LOOOOOVE! Especially the color scheme! Dang, I am going to have to make this! Amazing!!! Such a lovely shawl design. Thank you so much for the pattern!! You are welcome Darlene :) Have fun making it! Thank you! I am wearing it lots. The yarn is nice and soft too so I don’t want to take it off! A very striking pattern. I would love to try making it. All I need is to find someone who needs a shawl! 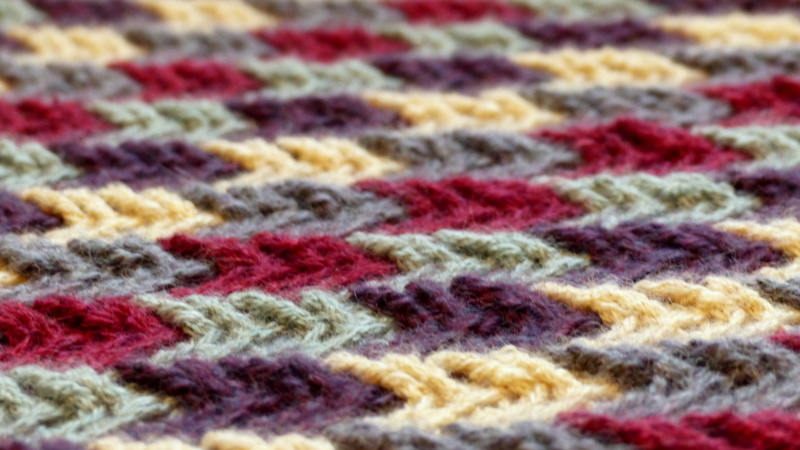 Yes it’s a fun stitch – it looks more complex than it actually is! Gorgeous pattern! Thanks so much for sharing! Love, love, love this pattern. I have a very soft cotton/merino blend that has been in my stash for a long time now and I think this is the perfect pattern for it. I’ll have to change hook sizes but I’ll keep in mind what you said about the density of the fabric. This is soooo beautiful!!! It looks like it will be a challenge for me to take on, but take it on I will…Thanks so much for this pattern!! This is sooo beautiful!! I think this will be a challenge for me to take on, but take it on I will….Thank you for this excellent pattern!! Hi Deb! I say go for it. You can try making a sample in stash yarn with a slightly larger hook than you’d normally use if you don’t want to buy the yarn before trying it. Just make the first 16 rows. If you can’t get the yarn I used then try anything with some natural fibre in it such as merino. A blend would be fine! The main reason is you will get a shawl with more drape once blocked. Check out my post on yarn selection for more info on choosing yarn! Thanks k.t.! 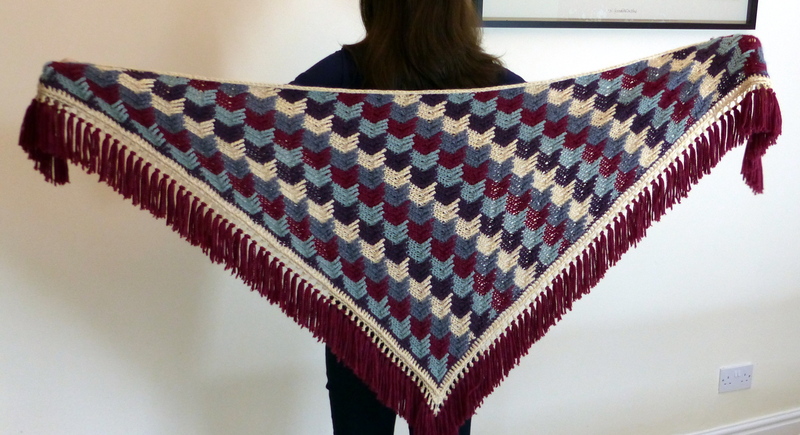 You could make an afghan by making a starting chain your desired width in a multiple of 8. Then work 4 rows in the back/front rows (depending on direction) before switching colour and starting the repeat pattern with the f.o.w. stitches one every 8 stitches (i.e. 7sc, f.o.w.dtr, repeat). Just move the pattern on one stitch each row. Hope that helps! Hi Esther – my goodness you are an absolute genius! This is gorgeous! I’ve been trying to follow the pattern for 2 weeks now but for the life of me I’m having a blonde moment & don’t understand how it works. In particular R5 with the hdc into the front loop of the 1st stitch after you’ve done a stitch in the back loop of that stitch? & to be honest I can’t grasp the F.O.W Tr stitches & where they go? If you had time to offer any support or pictures/video I’d really really appreciate it! Thank you for sharing it all the same! Hi Hannah! I’m glad you like this. Sorry you are struggling though! For the sc in back loop/hdc in front loop of same stitch, you can always just work (sc, hdc) into both loops if you prefer. It will look very similar and the important thing is to just do the same for your whole project so the top edge is consistent. For the f.o.w. sts, you could try making the arrow tails fingerless gloves pattern. It’s the same process but on a smaller square to start off with, so you could try that as a sample to get the mechanics figured out. Ok, yes I will give the gloves a go thank you! I’m enjoying figuring it all out. Thanks again for your time & general incredible skills! Hi Jamie! Sorry no video, but making one is on my to do list (the list is really long so it could be a while). In the meantime can I help? Is it the making of the f.o.w.tr or the placement of it that you are struggling with?